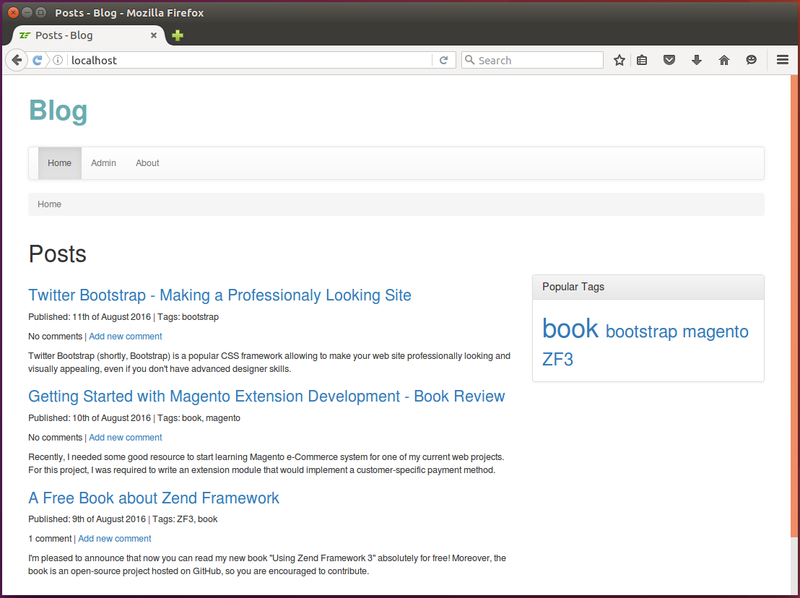 Another major feature we implement in the Blog sample will be the tag cloud. The tag cloud appears on the Home page. The tag cloud contains most popular tags, and tag's font size varies depending on popularity of the tag: most popular tags appear larger than less popular ones. Clicking the tag in the tag cloud results in filtering posts by this tag. to add controller's action and corresponding view template. Earlier we mentioned that by default Doctrine uses the Doctrine\ORM\EntityRepository as the default repository class. Custom repository is a class extended from EntityRepository class. It is typically used when you need to encapsulate complex DQL queries and search logic in a single place in your code. It is also possible to put the DQL queries to controller class, but that would make controllers "fat". Since we use MVC pattern, we strive to avoid that. DQL is similar to SQL in sense that it allows to write and execute queries to database, but the result of a query is an array of objects rather than an array of table rows. For more information on DQL and its usage examples, please refer to this page. For our Blog sample web application, we need a custom repository which allows to find published posts having at least one tag (to calculate total count of tagged posts), and, to find published posts filtered by particular tag. We plan to encapsulate this search logic into the custom PostRepository repository. Doctrine works with custom repositories transparently. This means, that you retrieve the repository from EntityManager as usual and still can use its findBy(), findOneBy() and other methods. and the findPostsByTag() method is designed to return all published posts that have the particular tag assigned (to filter posts by the given tag). // This is the custom repository class for Post entity. // Finds all published posts having any tag. // Finds all published posts having the given tag. In the code above, we use the query builder to conveniently create complex DQL queries. To learn more about Doctrine query builder, please refer to this page. Above, in line 6, we use the repositoryClass parameter of the @ORM\Entity tag to tell Doctrine that it should use PostRepository repository. // Calculates frequencies of tag usage. In the code above, we have the getTagCloud() method that selects all post having at least one tag attached and calculates the "frequency" of each available tag (how often the tag appears). Then it normalizes the frequency values (makes them to be between 0 and 1.0). Here we will modify the IndexController to implement tag filter. // Constructor is used for injecting dependencies into the controller. The action method will retrieve the tag from the GET variable tag if the variable doesn't present in HTTP request, all posts are retrieved as usual. If the variable present, we use our custom repository's findPostsByTag() method to filter posts. In line 36, we call the PostManager::getTagCloud() that returns array of tags and their frequencies. We use this information for rendering the cloud. Please note that we are now using the PostManager service in our controller and have to inject it into the constructor. Do not forget to modify the controller factory to do that.